LUXURY APARTMENT EQUIDISTANT FROM JUAN LES PINS & ANTIBES. Luxury apartment situated in central location, close to all local amenities. In the heart of Juan Les Pins and equidistant to Antibes this modern apartment offers two bedrooms with fitted wardrobes, living room/dining room, fully fitted kitchen, bathroom with twin basins, bath and fitted shower, separate w.c and 10m balcony. The apartment also benefits from reversible air conditioning, video entryphone, lift, TV & DVD player, ipod speaker dock, wifi connection & secure underground garage and attractive communal grounds. End of stay clean, towels and bed linen included in the weekly price. We are a family of six and live in Kingston Upon Thames. We love visiting Juan Les Pins/Antibes and we regularly holiday here all year round. As we have four children from young to teenagers & the area is perfect for all their different needs. We love the mix of beaches, walks and towns/villages to explore. The property is located equidistant from Juan Les Pins & Antibes. 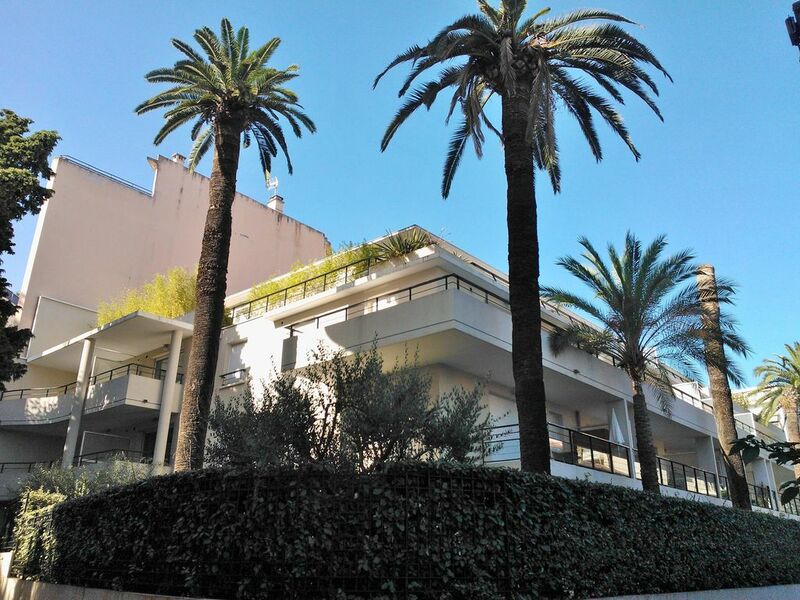 A superb location & easy walking to either beaches on Cap d'Antibes or Juan Les Pins. The train station is a 5 minute walk away so you can explore Cannes, Nice, Monaco etc. Cannes is only two stops and 10 minutes by train, so the apartment is ideally placed should you wish to visit the local festivals/exhibitions Cannes has to offer; Monaco is a direct train journey away, again the apartment is ideally placed should you be visiting for the Monaco Grand Prix. We have the choice of restaurants from both Antibes & Juan Les Pins offering superb food & vibrant atmosphere. The apartment is in a quiet location, situated to the rear of the building overlooking the small gardens, however conveniently close to all amenities. The area is very vibrant especially through the Summer months with lovely beaches, walks, shops and restaurants. Juan les Pins beachfront in the evening is especially lively with its restaurants on the sandy beaches and outdoor jewellery stalls. The apartment is so convenient for everything as it is between Antibes & Juan Les Pins. We are situated very close to the Supermarket which is open all day and most of the evening. The Boulangerie is a five minute walk for fresh croissants in the morning. Juan Les Pins is quite small and safe for the older children to wander off. The apartment is very close to the night life in Juan Les Pins but far enough away for a very peaceful evening on the balcony. The apartment is very well appointed and extremely comfortable. The Crystal Bar in Juan Les Pins is the family's favourite for enormous ice creams, cold beers and cocktails! The trains from Juan Les Pins are also very convenient for exploring the region, Cannes, Nice, Monaco and Marine land are all very accessible. Bathroom has twin wash basins with cupboards & drawers under, bath with shower attachment and shower screen and heated towel rail. Fully tiled with low voltage ceiling lights. Very popular sandy beaches to be found in Juan Les Pins and Antibes. There are also fantastic beach front restaurants with private sun loungers, beach & water sport facilities. Juan les Pins has a vibrant, lively atmosphere & is famous for it's jazz festivals. There are many busy restaurants and cafes and the apartment is a 10 minute walk to the beach. Cloths dryer located on balcony. Garage provides parking for one car. Open plan living/dining room, with two double sofas' (one sofa bed), TV & DVD player, ipod dock, dining table & chairs for six, storage unit & CD/DVD rack and double doors to balcony. Dining table which opens for six people. Open plan living/dining room, with double sofa bed and additional sofa. TV & DVD player, IPOD dock, storage cupboard and double patio doors to balcony. In living room and additional TV in bedroom. There is a music dock and remote. Well maintained and secluded communal gardens. 10m balcony, with views over communal gardens. Table and chairs for six people and two sun loungers. outside light and tap. Built in 2008, this first floor apartment is situated in an ideal location to explore both Juan les Pins and Antibes; The apartment is offered in excellent decorative order, with modern fixtures and fittings, fully fitted kitchen, modern bathroom with separate WC, a 10m balcony which is east facing catching the morning to midday sun. There is a garage located on the first floor lower level, with secure remote access and lift. The property has secure window shutters and reversible air conditioning. Juan les Pins has a vibrant, lively atmosphere & is famous for it's jazz festivals. There are many busy restaurants and cafes and the apartment is a 10 minute walk to the beach front, offering beach side restaurants, cafes, private & public sunbathing. The motorway A8 is easily accessible and it is 2 minutes from the local supermarket which is open all day. The train station is a five minute walk with trains to Cannes (10mins), Nice (25mins) & Monaco (45mins). Stayed in this apartment for four nights, and it couldn’t have been better. The location is excellent, and the apartment is superb. If I was going back I wouldn’t stay any where else. Really lovely apartment in great & quiet location close to Juan les Pins centre & beach but also close to Antibes. Well equipped & comfortable property, with great balcony overlooking communal gardens. Fantastic location and lovely apartment! A lovely very clean apartment with a fantastic balcony and everything you could want for in an ideal location close to the beach and the everything that Juan Les Pins has to offer. We had a brilliant holiday and couldn't have asked for more. We will definitely be back! We were very happy with this apartment, it had everything we expected. It was clean, well maintained and well equipped. The location is extremely convenient, the town centre, beaches and restaurants are just a short walk down the road. The train station is a 5 minute walk away, there is no need to have a car here. Best rental for a long time. Thank you very much for your kind review, we are pleased you enjoyed your stay. "Appartment was exactly as advertised. All the necessary shops were nearby. Appartment was overlooking a quiet enclosed garden so no street noice. Morning sun on balcony"
"The apartment was modern and well equiped located halfway (walking distance) to both Antibes and Juan les Pins." The property is equidistant from Juan Les Pins & Antibes. A superb location for ease of walking to either beaches on Cap d'Antibes or Juan Les Pins. The train station is a five minutes walk with trains to Cannes 10 mins, Nice 25 mins & Monaco 45mins. Juan Les Pins is renowned for Jazz Festivals and excellent family evening entertainment. There is a choice of restaurants from both Antibes & Juan Les Pins offering superb food. The apartment is quiet as it is at the rear of the building overlooking the small garden. The area is vibrant with its restaurants on the sand and nightly jewellery stalls. The supermarket is a two minute walk away and it is open all day. The boulangerie is a five minute walk for fresh croissants and french bread. The A8 motorway is easily accessible. Downpayment / Deposit requested. Security deposit requested. Owner not present on location. The price of the stay includes towels, linen, bedding, utilities and an end of stay clean. Additional Information: We have a FRENCH bank account, so if preferred payment can be made in EUROS. We will offer you a good exchange rate, so your stay will not be as expensive when applying the current exchange rate to our advertised price in pounds (sterling).